The Double Cowgirl is rapidly becoming a classic big-fish lure. It is truly something different for in-line spinners. 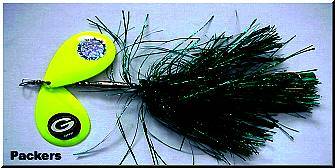 The huge # 10 Colorado spinner blades create a tremendous vibration in the water. 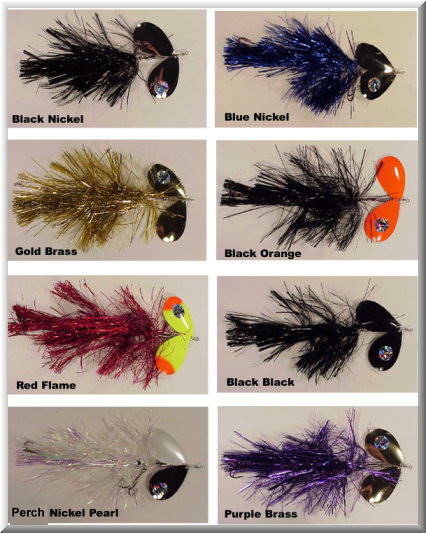 The flashabou skirting gives it color, life-like action and a huge profile, making it the best baitfish simulating inline spinner on the market today. Two 7/0 Mustad treble hooks give it an excellent hooking percentage, so you are sure to catch the big one. NOTE: Shown at the bottom of the photos are three keepsake lures for three NFL teams…the Minnesota Vikings, the Chicago Bears and the Green Bay Packers. 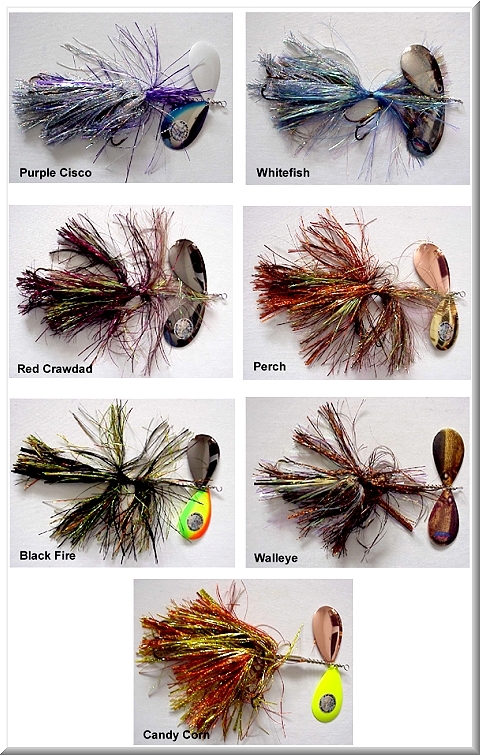 These are great lures for your collection…or to give as gifts. 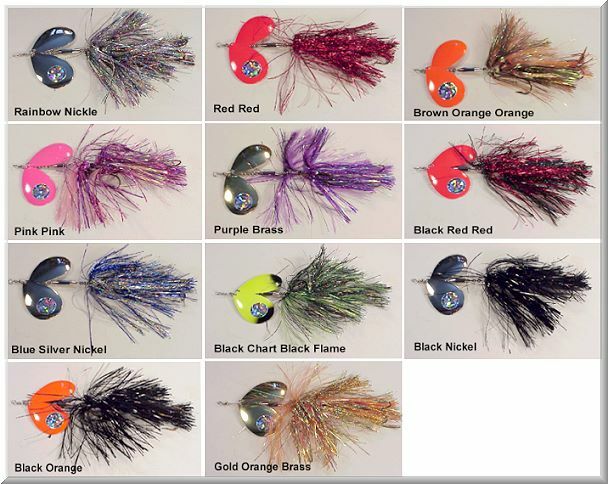 With hundreds of Muskies over 50 inches caught since 2006, when they came on the market, these lures have changed the history of Musky fishing. It is 10” long, weighs 2 ¾ ounces, and comes in 23 bright colors. Get yours now! Our low, low price is just $22.00. 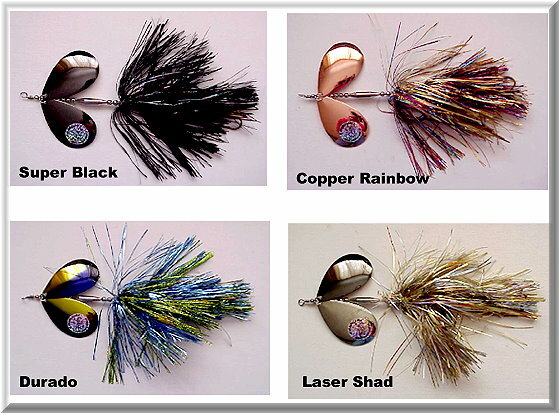 The brand new Trolling Girl lures, which many of you have been waiting for. 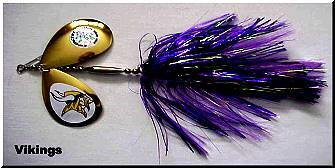 A lure very similar to the Double Cowgirl, but which has added weight and other features that make it excellent for trolling. 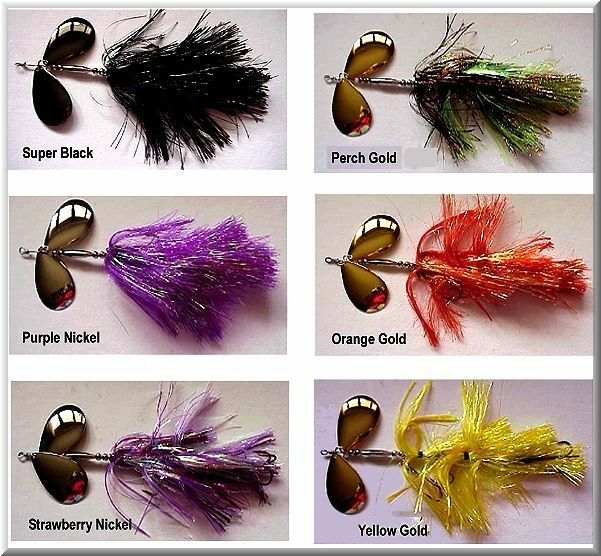 There are six beautiful colors available, so take your pick...and, as usual, we are offering this lure at an excellent introductory price. The Perch Gold Is Out Of Stock!! Get Yours today For Only $21.00 Each!!! 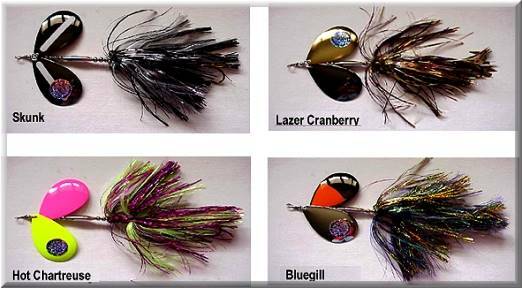 If you are a firm believer in the motto “Big Lures Catch Big Fish,” and think that size really does matter, here is the lure for you. Those really big Muskies don’t waste their time and energy chasing a lot of small lunches, when they can get one big one…and this one is it! Bigger than the rest, the Super Model Double Cowgirl is a real trophy getter! 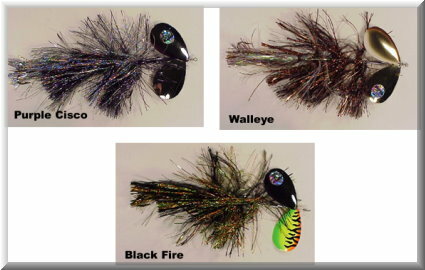 This bucktail will wake up the dead. It is great for over your favorite weed bed or rock bar. 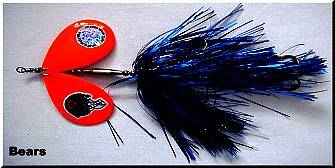 Two Custom #13 Blades, 13 inches long and 3 Flashabou skirts make this bait one of a kind. The custom #13 blades were designed to pull no harder than the 10” Double Cowgirl. It sports two Mustad 7/0 Treble hooks, and weighs 4.5 oz. Our low price is only $23.00, while other retailers charge as much as $29.00.